Dave Splash Dot Com: Do You Want the Tea Party Counting the Votes in 2012? 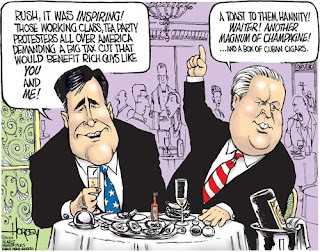 Do You Want the Tea Party Counting the Votes in 2012? Do you want the Tea Party to count the votes in 2012? With less than four weeks left until the election, many Secretary of State races in key battleground states hang in the balance. Whoever is elected now will be in charge of counting the votes for President Obama's re-election. • In Ohio, Tea Party endorsed Republican Jon Husted is running to take back this seat for conservatives. Husted would be a giant step backwards for this key battleground state. • In Michigan, Ruth Johnson won the Republican Secretary of State nomination after courting tea party supporters. • In Iowa, Tea Party member and conservative Republican Matt Schultz is running to repeal Iowa's innovative same day voter registration and other election reform. You loose all credibility, Splash, when you mention the Gore election in such context. Florida's Secretary of State Harris FOLLOWED FLORIDA STATE LAW with the recount precisely. The Democrats insisted on recounting again and again, presumably until they got the outcome they wanted. The Supreme Court only stepped in and said that the state law must be followed when the Democrats were screaming to violate it so that people wouldn't be "disenfranchised" as their cover story. In other words they wanted to falsify the recount. Frankly, in retrospect, if Gore had been elected, his single term in office might very well have allowed the country to come to the realization sooner that the Democrats are no longer sane enough to govern America and we could have begun the restoration of the nation to its rightful constitutional roots. Not only that but with the corruption on the left with voter registration and falsification, I can understand why they would also want to be in charge of counting the votes. The only way they would be able to hold on to their power is by nefarious means. Put down the tea and walk away. Slowly. Don't make any sudden movements. Seriously!? That is how Fox News and Limbaugh have spun one of the darkest periods in American history? First of all, Harris was the state co-chair of the Bush campaign. She should never have been allowed to be both the state office holder who certifies elections, and the lead advocate for one of the campaigns at the same time. If the party's had been reversed in that situation, there would have been much more made of that. Second of all, it was the FLORIDA SUPREME COURT that decided that the counting should continue. It was Harris and the Bush lawyers that sought to deny the voting rights of thousands of Floridians by stopping the count when Bush was ahead. The Bush v Gore case was one of the three worst Supreme Court decisions in history. Even the partisan "justices" with the majority said in the opinion that this decision should not be used as precedent in the future. Kind of a giveaway that their decision was pure right wing activism and completely unconstitutional. A Gore Administration would not have invaded Iraq, would not have given tax cuts to millionaires that squandered the Clinton surplus, and would have finally moved forward on getting this country away from fossil fuels and begin to stop giving all our money away to evil regimes like the Saudis. Yeah, that would have sucked.